Ride'em Cowboy! Remember the mechanical bull craze, Urban Cowboy, John Travolta and all that hubbub? The mechanical bull disappeared due to the number of Chiropractors it kept in business. Well it's back, it's safe, and it's interactive. Instead of using an Electro/hydraulic system to fling people around we developed a bungee system controlled by the partygoers. 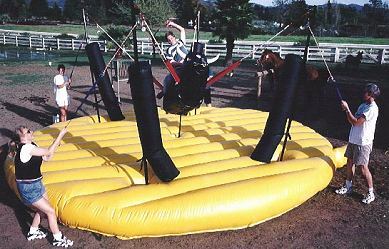 The life-sized bull is suspended from a steel frame by four powerful bungees. Underneath the bull lies a giant inflatable mattress to cushion a fall. One rider hops on El Toro while four friends each grab a bungee and begin oscillating the bull. The rider holds on to a rope/strap and tries to remain on the fierce beast for as long as possible. The motion is surprisingly similar to the real thing and it's a challenge to hang on. Forty riders and 160 bungee agitators per hour can participate. Yeeeee-hay!